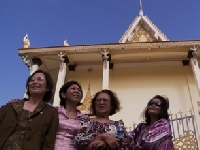 Daze of Justice is the intimate story of trailblazing Cambodian-American women who break decades of silence, abandoning the security of their American homes on a journey back into Cambodia's killing fields, only this time not as victims but as witnesses determined to resurrect the memory of their loved ones before the UN Special Tribunal prosecuting the Khmer Rouge. Only Daze of Justice takes us beyond the Killing Fields. The women must not only find the courage to remember their past, they also face an unexpected and agonizing predicament when they come face to face with Phang, the son of Kaing Guek Eav (Alias "Duch"), one of Pol Pot's most notorious torturers. And in the process, on the margins of the UN tribunal, the seekers become the source of Justice. The women not only generate a vocabulary for reclaiming the past but pave a path that extends the promise of redemption to future generations.